A deep breath of the crisp fresh air filled my lungs, and I opened my eyes. It was still dark out, and there were snow patches surrounding me. My feet were aching, my legs and body sore, but I was warm, and I was happy. 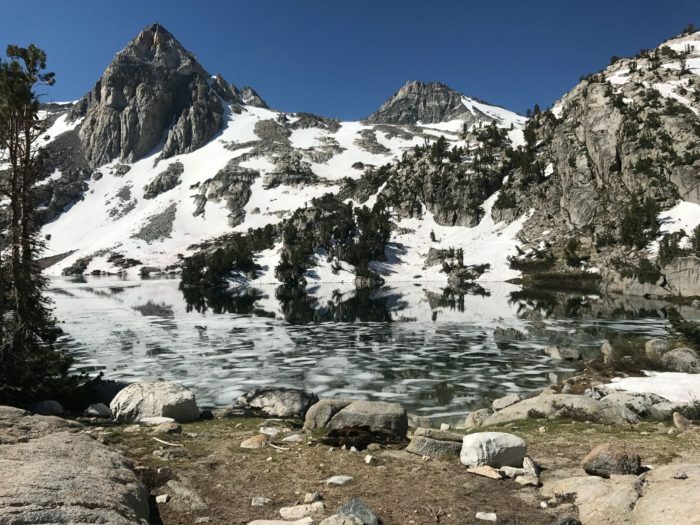 I knew I’d be ascending up Pinchot Pass that morning. I had four miles and 2,800 feet of gain to hike. I packed my sleeping bag and tent in the bottom of my pack and stacked all my other gear on top. I put my spandex shorts and hiking shirt on, braided my hair and tied my Altras. It was go time. Once I took off, I realized the extra food and gear on back was taking a toll on my chipper mood. I was in the longest stretch of the Sierra section: 90 miles from Kearsarge Pass to Vermillion Valley Resort. After about a mile, I started to feel sluggish. The elevation was getting to me, and I was stressed that the next few miles would be worse. So I weighed my options. Maybe I’d filter some water. Maybe I’d snack on a Clif Bar. Maybe I wouldn’t do anything at all, I’d just take a break, lay out my sleeping pad and nap. But I trekked on, and before I knew it, I was at the top of the pass, gazing at the snowy Sierra Nevadas. It was serene and silent up there, and I felt lucky to be able to gaze at this remote section of the world. Fast forward to three months later, home from the trail. I’m waking up in a bed. My body isn’t nearly as achy. I’m not dirty, and I’m not smelly. I have laundered clothes dressing my body. A full kitchen just feet from my bedroom. My phone is next to me, fully charged. I think about how I miss waking up to the forest. I look up to see my PCT hiker bandana framing my mirror. When I got back from the trail, I folded it so the only part I’d see is the part that reads “HIKER TO TRAIL.” My constant reminder to get back out there. A gleam of light is being let in from my window, but the four walls surrounding me began to feel suffocating, and the newfound freedom I found on trail feels like it’s being stripped away. I lack motivation to get out of bed. I’m not hungry. I feel drained. Something’s wrong, but I couldn’t put my finger on it. I ignore the thoughts and get out of bed, it’s just morning moodiness, right? I get dressed, ate a banana, start my car, put on some tunes, and head to the gym. The car in front of me is going too slow. I forgot my water bottle. My phone buzzes from a message from one of my friends, and all these sounds and distractions make me irritable. After the gym, I head to the gas station. There’s a long line, and I get stuck in my head again, wondering what I am going to do with my day. I should probably get a job soon. But the idea of a 9 to 5 job is even more daunting than the suffocating feeling of being surrounded by four walls at home. “Fill it with regular,” I say to the attendant. Driving back home, I think about how ungenuine that human interaction was. I should’ve asked him how his day was going. Or would that be weird? I get home, make a protein smoothie, and scroll through social media. An hour later, I find my thumb in the same position it was an hour ago, still scrolling. What do I want to do today? I ask myself again. While I was on the trail I felt capable. I loved having a numeric mileage goal every day, and I loved the big-picture goal of getting to Canada. I was also releasing an insane amount of endorphins. Endorphins are chemicals that interact with receptors in brain cells that help relieve pain and control emotion. Endorphins decrease fatigue, and provide athletes with an euphoric rush for an extended period of time. When I got back from the trail I went back to the gym and kept up with running, but my decreased level of physical activity led to a huge drop in endorphin release, and it took a toll on my mental state. The feel-good neurochemicals that were being released were replaced with feelings of sadness and stress. I went from being in the best shape of my life, meeting new people constantly, and accomplishing goals daily, to being broke, jobless, and confused. My backdrops changed from mountains, rivers and sunsets to concrete buildings, cars, and convenience stores. The exposure to a different lifestyle was awakening. And when I got back from the trail, I felt like I had all this energy, and nowhere to put it. Being back in the real world felt aimless and purposeless, and trying to find a solution felt paralyzing. I wanted to be free again. I wanted to run in the forest and play with my friends. I wanted to continue jumping in rivers and climbing up passes every day. To have deep conversations with hikers I’d just met about humanity. And I couldn’t do that anymore, and I just didn’t know what to do with myself because of it. I was restless, I was frustrated and I felt alone. I didn’t talk much about it. I put myself in my own mental prison, and it felt impossible to get out. I was mad this was the world I lived in, and that this is the society that we humans have created. I wondered why I felt so weird to ask the guy at the gas station how his day was. Is genuine conversation so lost that we question ourselves to ask how someone’s day is? So here’s what I did. Here’s what helped me. First and foremost, I began being public about the struggles I was facing. That was one of the biggest difficulties for me to overcome post-trail, but I also think the trail is the reason I now have the confidence to do so. I take time to write about what is going on in my head and process it. And when I’m ready, I share it with friends, family and post it to social media. The responses I got from my friends, and some people I’ve never met, has literally given me life. Being able to connect with others who share the same struggles has made me feel like I am not alone. For me, that is extremely important. With this, I had to overcome the fear of what people would think about me being so open about my emotions. Specifically people from my hometown, who knew me before I was hiker/emotional Alex. That was hard, and that’s still hard. I have to remind myself of that constantly that if someone doesn’t want to see what I post, they have the freedom not to. I’ve also progressed my hobby of running races. Before the trail, I’d ran in a couple of races, and one of the first things I did post-trail was sign up for my first marathon. It gave me a goal to look forward to, and I reminded myself of that goal every day—especially when I was training. It helped me fill my calendar with activities, and forced me to believe in myself again. Racing also helped me connect with other runners that I found through social media, as well as people from my home town who I’d always looked up to. Being able to chat with them about something we are both passionate about is so much more fun than talking about whatever town drama is going on at the time. Some days when I was feeling really low, and just didn’t know how to fill my time, I would go do a simple task like grocery shopping and try to connect with someone about their day. On trail, I’d rarely walk past another hiker that I didn’t say hi to. Sometimes the conversations would be short and sweet, and others were long and deep. I loved having both of these type of interactions, and when I came back to society I lost that because people just aren’t as interested in talking to others about their thoughts and emotions. I am. So I had to find people like me, in the world that I live in. It didn’t always work. Sometimes I’d go to the grocery store and chat with the checker. Sometimes they’d want to talk to me, and sometimes they didn’t. But hey, I tried, right? Maybe it’ll be better next time. And, surprisingly, it usually was. I also began to make moves for myself, based on what I wanted to do, simply because I wanted to do so, and realized that WAS good enough. 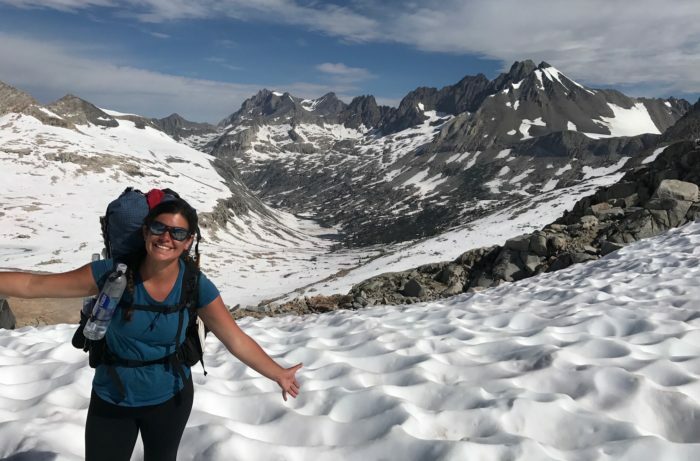 When I got back from the trail I felt bogged down by the pressure to get a “real” job – but if I was certain of anything, it was that I knew that is NOT what I wanted to do. Eventually, I decided what I wanted was to travel. No matter how I was going to do it, I made it my number one priority. I realized that not every trip I go on is going to be glorious and life changing, but as long as I was exploring a different neck of the woods in the world, I would be happy. Above all, I think I began to accept who I am in the world that I live in. I loved who I was on trail, and when I got back from the trail it was easy to feel like I wasn’t the same person I was the last five months. But I was, and it just took me realizing and accepting that. One step at a time, I’m still hiking my own hike. Really great post! I love you’re authenticity ? Thanks so much for reading the post & for your feedback! I totally agree – compassion is something learned through struggles. I often find myself looking at photos I took on the trail, it is a great measure to reminisce and bring authenticity of the hike to my every-day. I love that you return to the trail every year! How amazing. Thanks again for reading & for your advice! Happy trails! Hmmm… I might be biased because of the military community but outside of hiking you must find a job that you love, not a job that is boring. Unlesss you are rich, a high paying job that permits you time off to hike or are happily retired, you have no choice but to work. So be it….. Just go look for a job that you would love to do. Move to a place that is close to our great trails and find that perfect t job or a job you can live with. I understand that all WE want to do is hike forever but it is not possible in this day in age. But instead of hiding and complaining in our homes, you can hike daily for a couple of hours after work, bring a light meal for supper and be home by nightfall. And then you can leave early for the weekend and go for an over night or 2 nights, depending on the distance. Take a Monday as a vacation day to extend that hiking weekend. There is lots you can do to have the hiker feel. In closing, this is what your military does afterwards, we keep busy otherwise we will fall into depression. Thanks for reading and for your feedback, Adrian! No offense taken, I appreciate your perspective! It is definitely important to keep busy, and I try to relay that in this post. For me personally, I had never experienced a state of sadness like I developed when I got home from the trail, so it was a bit more difficult for me to get myself going. I felt immobilized and paralyzed by the emotions I was feeling. It’s been a work in progress for me, and I think relaying to others that the state of sadness that I faced was OKAY for me to be in, and ultimately part of my process to adjusting back to society, was important in this post. We’re all human, after all. I also think it’s important to note that there are a lot of alternative lifestyles nowadays that allow those interested in the outdoors to work while also exploring daily. I am trying to educate myself on these career types, and I am learning every day. Thanks again for reading! And happy trails to you, too! I am thankful for having read your post hike thoughts and feelings. I have been off the trail about 2 1/2 months. The trail was my friend for days on end…morning, noon, and night. I was able to share in views, weather, growing in and thru a myriad of thoughts and feelings. I listened more carefully, felt deeper and passionate than ever. When I departed, I truly lost a close friend…it is truly difficult in mainstreaming alone. After I am able to find my/a place again, it will become easier to live more in peace within, until then, my heart and soul longs for that faithful, steadfast beauty called my friend, the trail! Absolutely Craig! I know how you feel, you are not alone. So glad you read & related to the post. Best of luck with post-trail life, and happy trails for the future! Great story. 1 question though. Where do they still have station attendants that pump your gas? So well said. I completely understand, especially the part about coming home and it being difficult to find those willing to have a genuine conversation. People just treating people as machinery, backdrops as we go about our day. 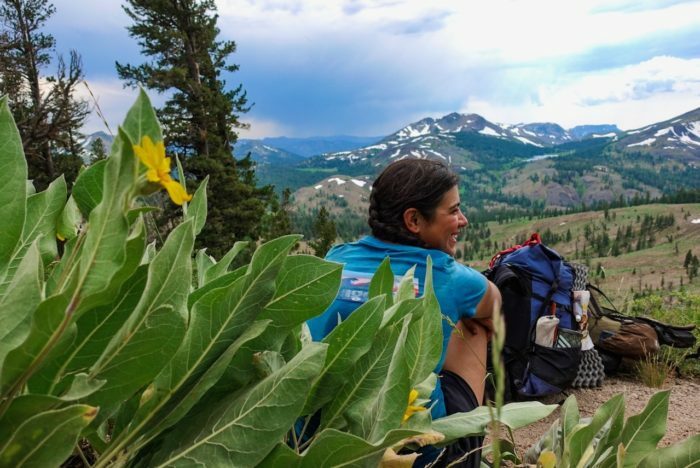 Some of the best parts of trail life are completely lacking when you return and, as you said, you’re full of energy and life and ready to keep sharing and connecting! I think it’s so great you have been able to identify and share what you’re going through; that seems to be half the battle. I have been off trail for 2 years now and still struggle with these things. 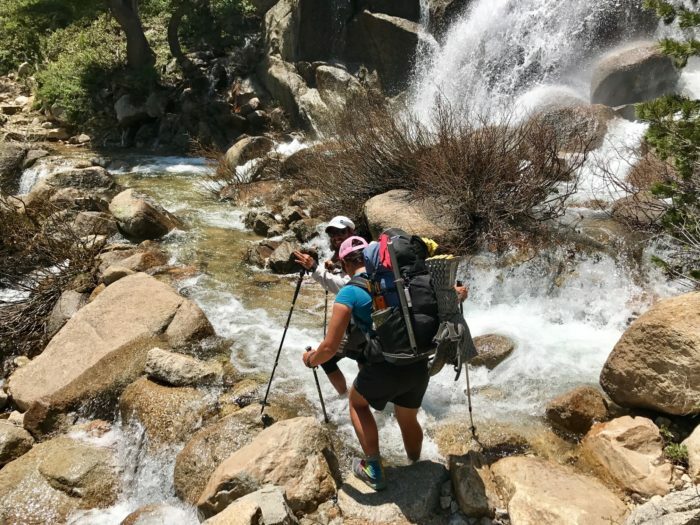 Some days are easier than others, but there is still a void from that connection and community the trail provided. Keep searching! And keep writing, it makes me happy seeing others that have the strength to give their lives direction. I feel that completing a long distance hike is like grieving a loss. It’s a continual process. But ultimately (of course) you’re better for having experienced it. Not everyone gets to feel so alive for so many months, and be blessed with the awareness that such things exist in the world. The hard part is to figure out how to make it sustainable when you’re off trail. And by the way, running is great isn’t it? I put a lot of my energy into long distance training post-trail, too! It’s great to have goals. Good luck with your marathon.